Courtship season has begun for the Goldeneyes on our local pond. 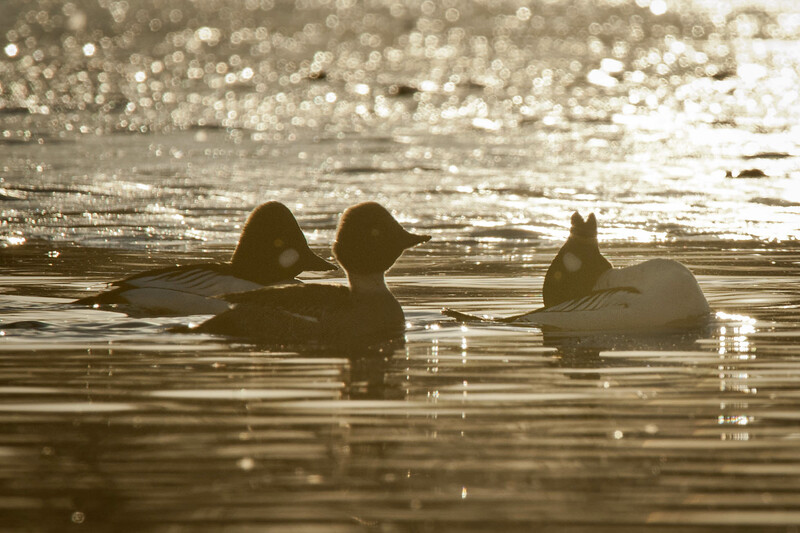 Photographed with the last bit of golden light reflecting off the ice, a male goldeneye tilts his head way way back in an attempt to attract the onlooking female while another male sizes up his competition. HI and thanks. It is so much fun to sit and watch these guys courting away. Strange to think it takes place this time of year. I love their courtship ritual – the backlight is a bonus! Hi Eliza, it is an amazing ritual to watch. It is always a bonus to get to experience behavior while observing other species. It gets one thinking about how this ritual evolved.